Sel et Poivre is one of my favourite restaurants in Sydney. It has been around for quite some time now, I remember coming here when I was still in Uni with friends and as much as I hate to admit this, I know the menu back the front. I have suggested this place to a friends for first dates, birthdays and other celebratory events and the feedback has been fantastic! I came here one evening with two of my dearest friends, M and A, and also asked my brother and his fiancé to join us. It’s a favourite amongst the diners, I think only my sister in law to be, O, has not been here. Without really perusing the menu, I already ‘knew’ what I wanted. F, O and I got there 15 mins early and I for one was famished! I had gone for a run and needed food! 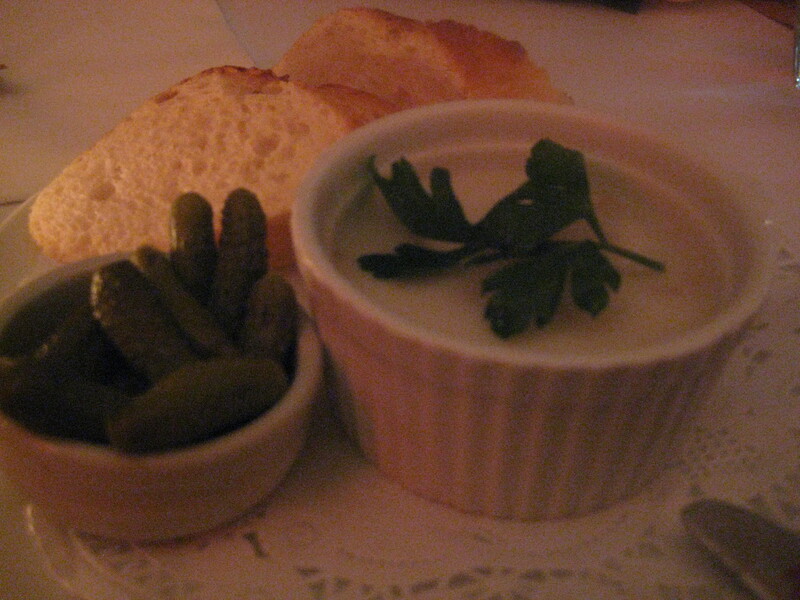 We started off with pork and duck rillettes with cornichons and baguette. I remember the first time I came here with F, we ordered this, and I remember him eating just the white layer on top. He didn’t realize at the time that the ‘white layer’ was actually fat! He did wonder where all the duck and pork where, little did he know that he was supposed to cut through the fat layer to get to the duck and pork! DOH! The rillettes were amazing! Eaten with fresh, warm baguette, it was the best way to start the meal! The cornichons, or gherkin was incredibly sour but utterly tasty. The combination of the bread, cornichons and pork, duck rilettes were just incredible! It’s definitely one of my favourite entrée dishes there! Believe it or not, between the 5 of us, we only ordered TWO types of dish! I knew exactly what I wanted, so did M. F, M and O ordered the marinated braised beef cheeks with Miramar Cabernet Sauvignon Sauce and Frites. 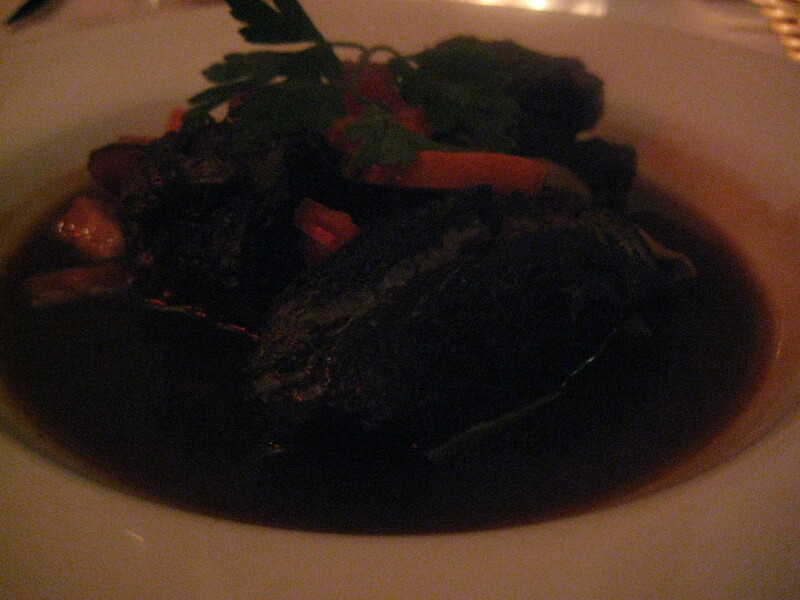 The braised beef cheeks were set in a pool of cab sav sauce and it was so tender that it fell right apart. The meat was unbelievably tender and it had a gelatinous texture that resembled a marrow. Carrots, mushroom and bacon came with the dish, to add flavour. It was absolutely divine. The frites were thin and crunchy! Unfortunately, I forgot to take a photo of this, but believe me, it was delicious! 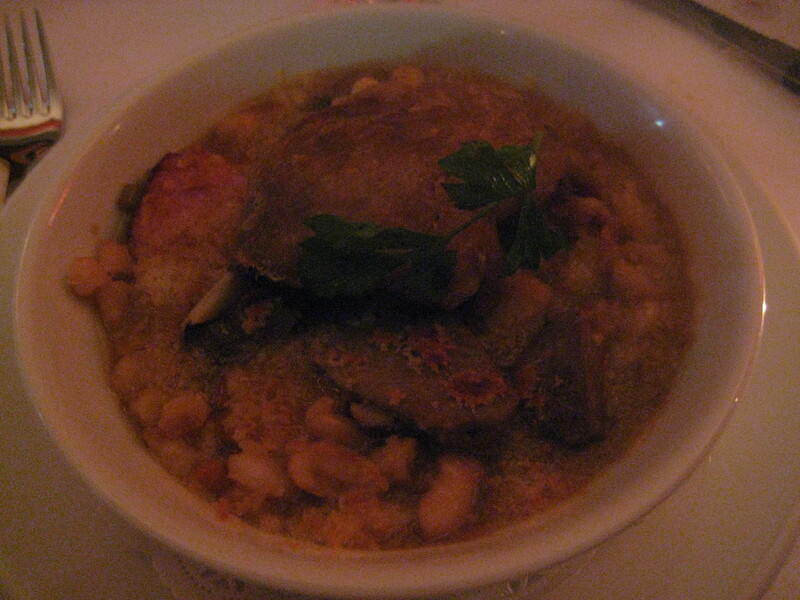 A and F ordered the duck confit roulette with white beans, and like the beef cheeks, the duck confit was incredibly tender. It was absolutely delicious. The white beans were a great compliment. It was a very hearty meal and perfect for a cold night! By this stage we were all stuffed! However, M and I couldn’t leave without having their crème brule. 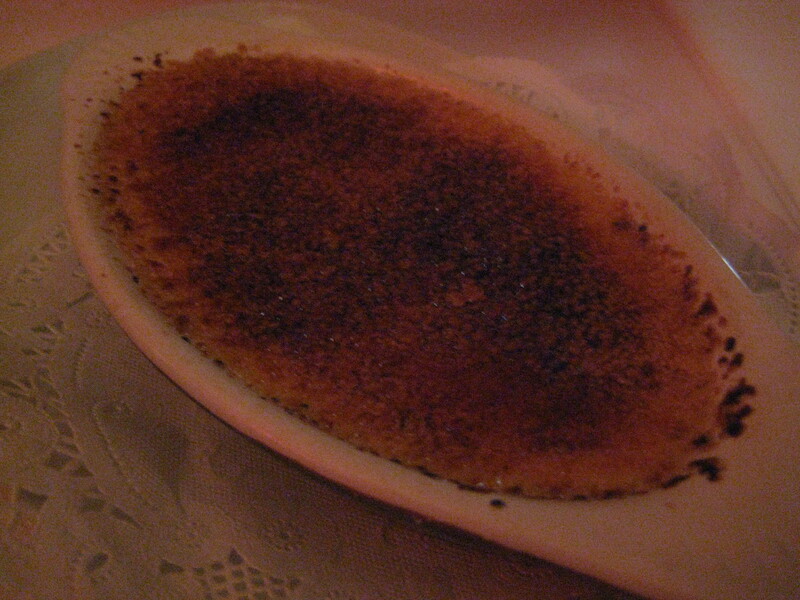 I believe it is one of the best crème brule in Sydney. It was served in a long shallow dish, the brule was cold and deliciously creamy and light. The toffee layer – sweet, crunchy and divine. At first, F didn’t want any, he claimed he was too full, however, after trying a spoonful, he couldn’t stop and demolished the rest of it! I think both M and I were thinking – damn it! You should have definitely gotten one on your own. It was the perfect meal with great friends! Incredible food, fantastic service – still a favourite of mine! This place does get busy, so make sure you make a booking. I have yet to try their breakfast / lunch – but dinner is fantastic! If you haven’t been, a definite must! lol u should have definitely got one for yourself!